Finely shred the apple and chop strawberries into small pieces. Combine all ingredients in a bowl, stir well until mixed, cover and allow to soak overnight in the fridge. 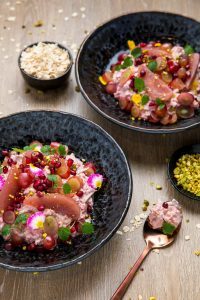 When ready to serve, spoon into a chilled bowl and serve with halved grapes, pomegranate seeds and crushed pistachios. Mix up your fruits and change up the nuts for almonds, walnuts or your nut of choice! Recipe kindly provided by Uncle Tobys – for more recipes visit their website here.